Autograph Manuscript, unsigned, one page, oblong octavo, undated, framed with a fine signature, Lincoln & Herndon, mounted below. The law firm of Lincoln and Herndon began in 1844 in Springfield, Illinois, when Abraham Lincoln, then an established lawyer, formed a partnership with the younger and more inexperienced William Herndon. The junior partner learned quickly and was extremely well-organized (a trait Lincoln did not share); while Lincoln spent a good part of his time travelling the Eighth Judicial Circuit, Herndon stayed on top of things at the office. Lincoln and Herndon were law partners for sixteen years and developed a close relationship. Their partnership actually lasted until Lincoln’s death in 1865 but after 1860, when he ran for President, Abraham Lincoln was not actively involved with it. Herndon would ultimately write a well-respected biography of his former partner. 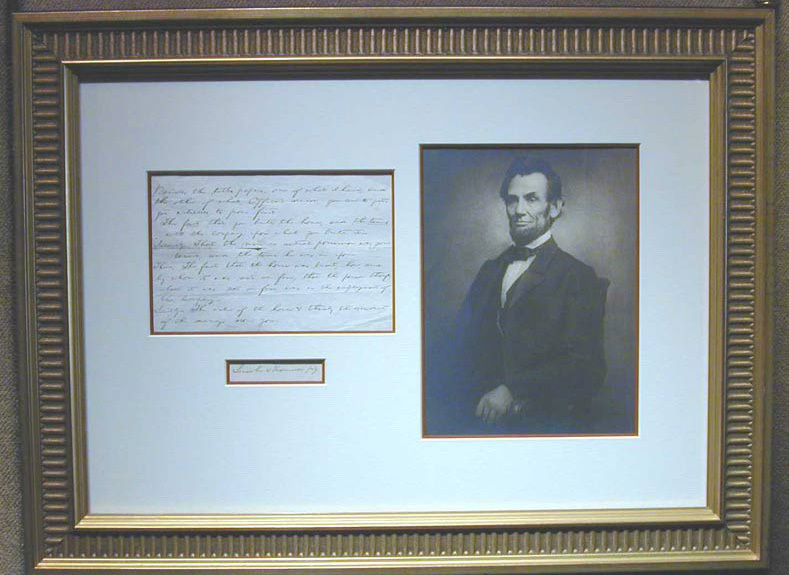 Matted in ivory and claret, with a portrait of the Great Emancipator. In a carved gilt and black frame measuring 23 inches wide by 17 inches high.